You can see in the broadcast we were able to bring Jenny Q right onto the screen (with a simple click of her comment)! There’s even a little video icon within the comments of your viewers while you’re live that lets you know who is available to join. Now I’m not going to go into a bunch of detail about how to set this up on Facebook – instead I’m going to direct you to the link that walked me through it on Social Media Examiner written by Peg Fitzpatrick. As a side note it was Ai Addyson-Zhang‘s tweet of the article that led me to it by a simple #FacebookCreator hashtag search. Meanwhile here’s a tip – you don’t have to purchase Canva For Work (as mentioned in the article) in order to get a transparent overlay on your screen. You can create a basic graphic in the free version of Canva and then select for it to be transparent right in the Creator app and it will convert it for you. Canva For Work might give you a little more control over this but you can get around it if you’re starting out. Having the graphics on your screen is nice – similar to what I used to do with OBS for Periscope broadcasts for certain shows. Now granted they aren’t as flexible – you can’t change them up on the fly during a broadcast, but they are cool to have there as I outlined in the graphic above. The option to add prerecorded bumpers (prerecorded video intros like your favorite TV shows for example) at the beginning and end of the live broadcast is really nice too. 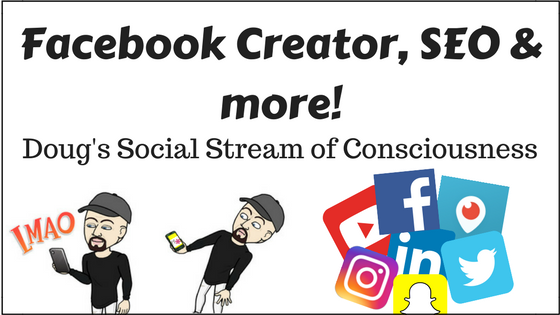 We haven’t done this yet but you can bet I’m looking for ways to use all of these tools to create new content for us on Facebook as well as for my social media clients. For those of you who tune in to our Periscope broadcasts don’t worry, there are NO plans to move the Doug & Ally Morning Show to Facebook! If you’re curious here is an article I wrote earlier this year that compares and contrasts the two platforms which is still pretty on point – there have been a few changes since then obviously, but the basics remain the same. I’m no expert when it comes to SEO but I have a basic working understanding of it. By using plugins like Yoast here for WordPress I’ve been able to properly place my content on the Internet so that it ranks well in search results on Google in our home base of West Bloomfield for example. Now, some might say one of the flaws in our SEO strategy is that we cast too wide a net which doesn’t allow us to dominate a niche and the people we snag aren’t as targeted as they could be. We are a high end / low volume photography studio. It’s just me and Ally and we put a ton of effort, heart and soul into every client and every portrait session. We bring a ton of experience and expertise to the table. We aren’t for everybody – we aren’t a cheap studio, don’t want to be, and yet we rank for plenty of general searches such as “West Bloomfield Photographer” which doesn’t discriminate between different tastes or budgets. I had someone call asking about pricing for a portrait session the other day. I talked him briefly through the process and the pricing and we were way out of the budget he was looking for – he wanted something really simple. Instead of turning my nose up at him I helped him through his options and what the differences are, and ultimately referred him to Focal Point in Farmington. They are a higher volume studio than us with a large staff and more basic options available. It won’t be the same experience as working with us but this guy wasn’t looking for the “best” – he was just looking for something “good” and economical. Nothing wrong with that. Focal Point been good to work with for us with seniors for class composites, they are a local family owned studio, and I still helped this gentleman – I’m comfortable sending him there because they are a professional outfit. The ease of entry has allowed too many non-professionals into this industry so I want to support actual studios. You uplift your profession, you play nicely in the sandbox and if you are in the business of helping people then do it wherever you can whether someone becomes your client or not. It’s good karma. What are your thoughts on these topics? Are you using Facebook Creator yet? Have a good SEO take? Let me know!